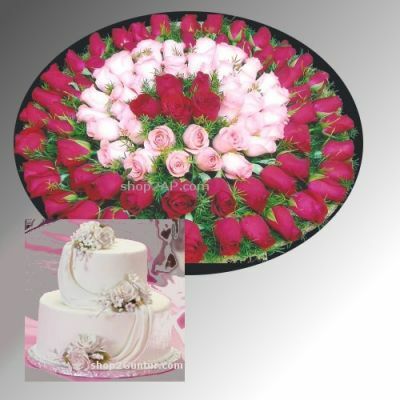 Beautiful 100 Red & Pink Roses in a round shape arrangement, 4KG Cakes with choice of your own Flavor. This arrangement is suitable for all occasions such as birthday, wedding anniversary, weddings, retirements gifts....etc.Send roses bouquet online along with a rich cake and surprise your dear ones on a happy occasion or festival. Our Roses Elegance –Cake is an elegant gift hamper comprising of a circular arrangement of 100 pink and red roses. The unusual combination of pink and red roses looks beautiful; our florist has made a wonderful circle with the flowers and has added green fillers to make it more attractive. The delicious 4 kg two tier cake (choose flavor from pineapple, black forest, butterscotch, strawberry, vanilla and chocolate) adds to the charms of the combo. Our Roses Elegance suits all important occasions such as anniversary, wedding, birthday, retirement, graduation and other happy events. If orchids are not available we will replace with Roses and Gerberas.